Avatar has taken a lot of heat because the story is relatively simplistic, and it’s fair to say that you won’t be surprised by the events as they unfold. But let’s give credit where credit is due: The story is, for the most part, motivated by character, even if that happens in much the same way that a freight train is “motivated” by a massive diesel engine capable of dragging tons of freight up a steep incline. And like this tortured metaphor, Avatar is not only impossible to stop once it gets going, but is also clearly heading towards a single destination that has to be clearly laid out beforehand. But what struck me more than anything is how Avatar crafts something unique out of the new tools of visual storytelling. Cameron seems to understand that the main danger of using such massive amounts of computer-generated imagery is that it can interfere with our fundamental need to form an emotional relationship with the characters on-screen. It’s clear that he spent a great deal of time giving his digital characters the ability to emote with enough human subtlety that we can’t help but find ourselves intrigued by them. These may not be humans, but they are, for a few instants at least, the first screen creatures that seem to truly engage our emotions at the most fundamental level. Gollum was a good effort, but he was a monster. He could evoke pity, but he was an animal. He wasn’t a creature that we could engage in with respect. And that’s why having the Avatars be remotely driven creatures is such an excellent metaphor. These creatures look like the humans that control them, and they have human emotions, although they’re not quite like us. On another level they are also obviously motion-captured from human performances, giving us permission to believe in the gorgeous cartoon panorama that is the alien world of Pandora. And finally they are a metaphor for the audience, as we are dumped into this virtual world that constantly assaults our senses with strangeness and beauty. The last film that tried to create this realized other-world was King Kong. But by putting that cross-species love story into the horrible and hostile world of Skull Island it ended up wearing its spectacle on its sleeve, and made it difficult to connect with. As I discussed in my piece on the Spectacular Shift, CGI imagery has a tendency to push us out of our normal method of perceiving narrative media, and slip the audiences into a state where they are open to purely visual stimulation. 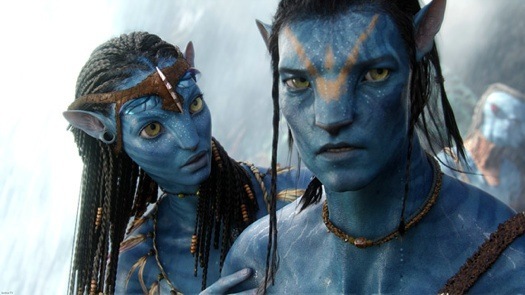 Although the story is getting a lot of grief for being too simplistic, Cameron’s greatest achievement in Avatar is how he determinedly, and effectively, swims against that tide for most of the movie. His goal is to keep us emotionally grounded even as our senses want to make us float away. It’s a shame that in the third act he seems to give up on this effort entirely, and spends the last hour of the film pummeling us with over-the-top imagery until we are nothing more than an over-stimulated bundle of rods and cones with an alarmingly full bladder. But if we are going to move beyond the idea of a big budget computer-generated move as nothing more than a loosely plotted series of explosions and pretty effects, it seems that Avatar may be showing us the way. But what struck me more than anything is how Avatar crafts something unique out of the new tools of visual storytelling. Cameron seems to understand that the main danger of using such massive amounts of computer-generated imagery is that it can interfere with our fundamental need to form an emotional relationship with the characters on-screen. It’s clear that he spent a great deal of time giving his digital characters the ability to emote with enough human subtlety that we can’t help but find ourselves intrigued by them. These may not be humans, but they are, for a few instants at least, the first screen creatures that seem to truly engage our emotions at the most fundamental level. Gollum was good, but he was a monster. He could evoke pity, but he was an animal. He wasn’t a creature that we could engage in with respect.